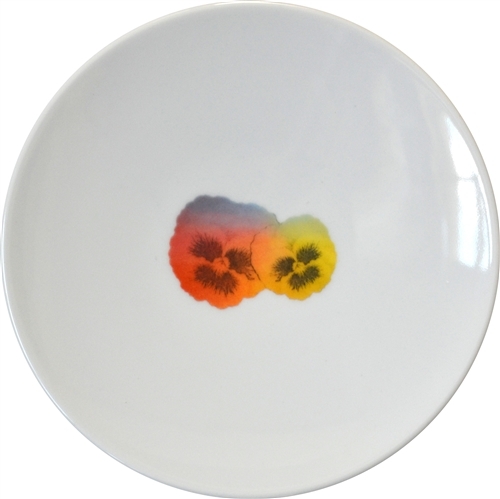 A modern take on vintage florals, these adorable plates will find endless uses on your table. Bright rainbow colors add a splash of happiness to any table setting. These plates are perfectly sized for appetizers and desserts, and also work as perfect condiment dishes around larger serving pieces. A must have for your next garden party! These fine Porcelain plates are handmade in America exclusively for Nourish™. Each plate measures 6.25 inches in diameter. Dishwasher and microwave safe. This sweet plate looks stunning paired with our Birds and Bees Salad/Dessert Plates. 6.25 inches in diameter, fine porcelain, handmade in America exclusively for Nourish™. Dishwasher and microwave safe. These plates, inspired by my travels and beautiful people I have met along the way, add whimsy and texture to any tabletop. An elegant addition to any dinner table or a wonderful way to brighten-up scrambled eggs!